Hello, everyone! I have finally jumped aboard the Saran Wrap nail art train! And I honestly have to say... why on EARTH have I not done this before? No. Seriously. Why not? This was one of the easiest things on the planet and was a hit with everyone at work. 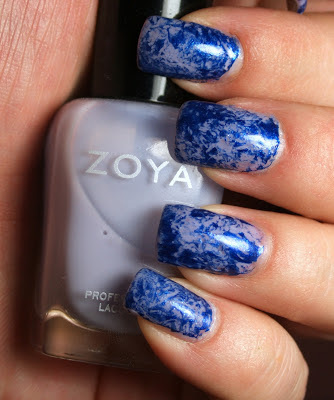 My base color is Zoya Miley, a milky lavender creme, and my top color is Zoya Song, a sapphire blue with subtle shimmer. If you're a newbie to Saran Wrap nails, the process is pretty simple. Apply whatever base color you want as though it were a regular manicure and let it dry completely. Once dry, crumple up a sheet of plastic wrap so that it's nice and crunchy. Apply one coat of your top color to one nail, immediately press the crumpled wrap to the wet nail, and then, pull it off. Repeat this with each nail. Work quickly to get the best effect. Then, voila! Saran wrap nails! 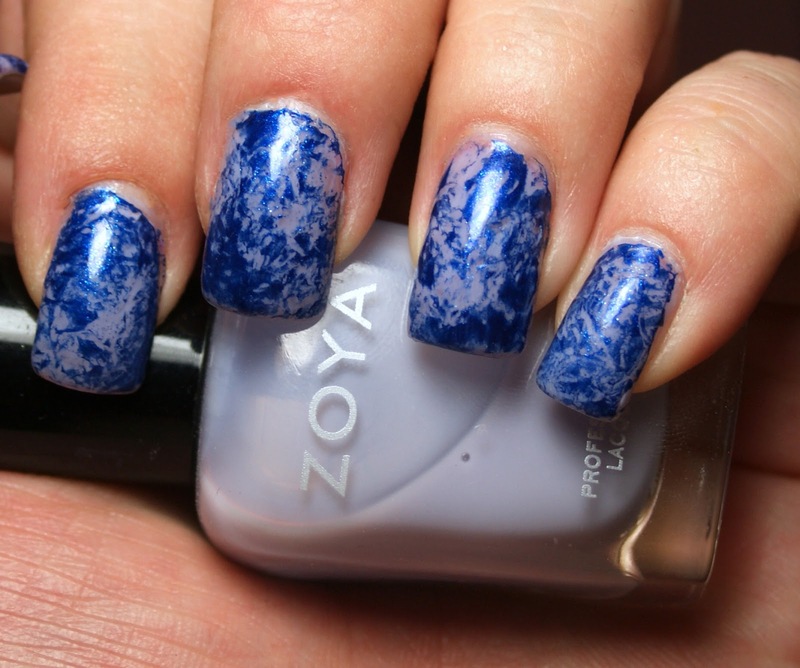 What do you think of this quick and easy nail art? I love how much contrast there was between shades! Pretty! Love the dark blue!! Pretty! I love these two together! Cute! I need to try this method with actual saran wrap! I had none the first time I tried it and used a tissue, lol.